Sample preparation is a crucial step in any analytical method, especially in chromatography where samples have to be homogenous, free of interferences and safe for the column. Today, one of the most widely used sample preparation methods is solid-phase extraction (SPE) that in the mid 1990s largely replaced the conventional but time consuming liquid-liquid extraction (LLE). 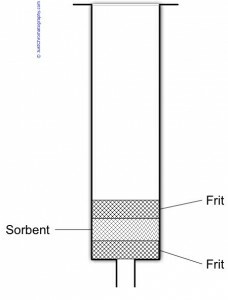 The SPE method resembles chromatography itself: a liquid sample is passed through a packed column that selectively removes interferences or analytes. The SPE sample preparation technique is frequently carried out in a small, disposable, plastic column (cartridge) that looks like a 10-mL medical syringe. 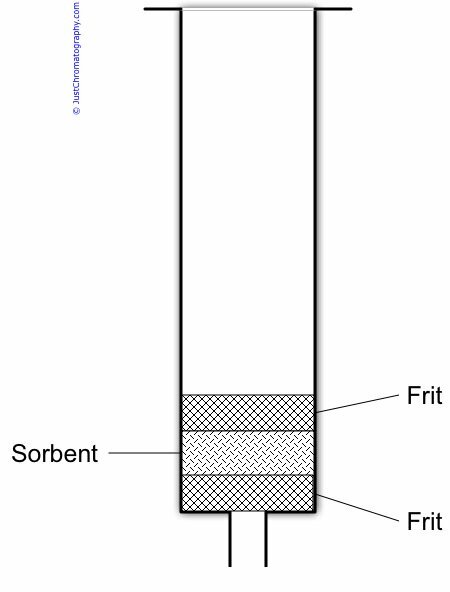 The column is packed with a small amount (< 1.0 g) of sorbent (e.g. C18-silica) which is held in place by frits. However, the SPE method can also be implemented by using a micro-pipette tip, a 96-well plate, a disk, or even coated fibers, the later has its own name – “solid-phase microextraction” or SPME. Yahoo Answers: What chemicals can be detected using a Gas Chromatography? Attempting to separate fats from organic sunscreen actives before the HPLC. I’m wondering if this approach would be a good one. Would the standards have to go through the same extraction to the calibration proper?